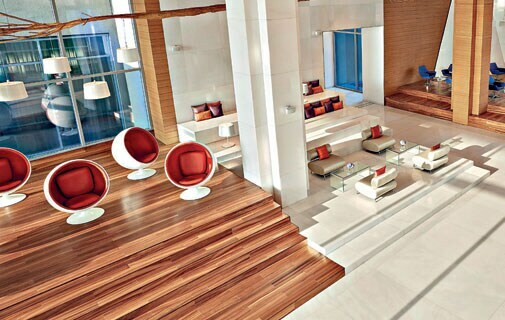 Vivanta by Taj inaugurates a new hotel in Dwarka, tailormade for the business traveller. Outside the window of the plush suite, less than a kilometre away, for every three planes that land two take off from the runway of Indira Gandhi International's constantly buzzing Terminal 3. The pattern becomes familiar in just a half-hour of planespotting, but the experience is sans sound. 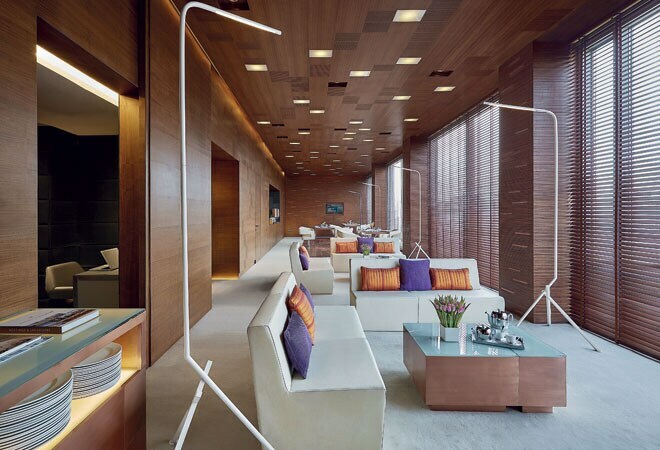 Within the walls of the Premium Indulgence room of the brand new Rs 380-crore Vivanta by Taj in Dwarka, in the NCR region, not a single sound from the steady stream of flying machines can be heard. In fact, even though you're in one of the busiest areas of the capital, no honking, loud voices or blaring stereos penetrate the silence. The hotel aims for modernism with an Art Deco style, foregoing excesses for a minimalist motif with informal and practical touches of luxury. 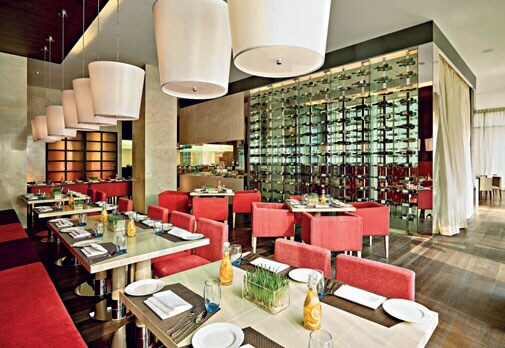 In just five years, the Tata Group-controlled Vivanta by Taj has grown to 30 hotels. Dwarka is the latest and the seventh property in the NCR alone. Vivanta already accounts for 30 per cent of the revenues of the Taj luxury brand and, despite Taj's Rs 590-crore losses in FY-14, is pushing on with aggressive expansion plans to open 10 new hotels in the next five years with Guwahati and Amritsar opening their doors this year. This bullish outlook comes with the belief that investment and manufacturing in India will kick off a nomadic culture of business-on-the-go. The business traveller is today looking for a place to get work done quickly, while unwinding, enjoying a spa treatment and also eating a great meal without skipping a beat. He is then eager to move on to the next destination with minimum time lost to traffic. While there are plenty of airport hotels that do the trick, what's been missing is a hotel that offers more than just a bed and a rub-down. 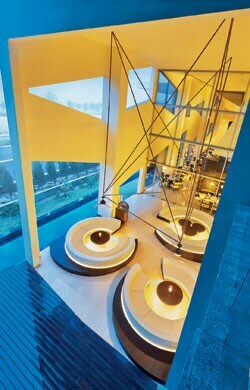 At the Vivanta Dwarka, the reception area provides two interesting spaces to get a bit of work done. 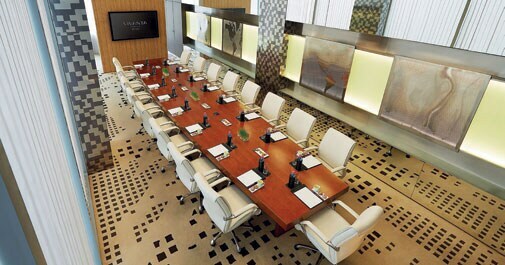 The first has chairs arranged around small meeting tables for a look over important documents. Across the hall is a more interesting futuristic looking space with individual pods that insulate whoever sits in them. The area's perfect for solitary time with the mobile to catch up on e-mails, update Twitter, check Facebook while keeping an eye on the main entrance to catch that ride to the airport. What makes the hotel a serious MICE destination, however, is the 1,500 mtr sqr of meeting space, including a large ballroom, pre-function space and outdoor lawns spread over various parts of the hotel.